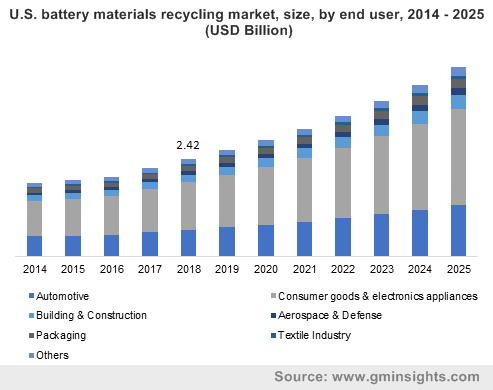 Battery Materials Recycling Market Size was estimated over USD 22 billion in 2018 and will exhibit growth of 9% up to 2025. Strengthened by rising environmental concerns, growing automobile sector, and reshaping electronics industry, global battery recycling material market is set to achieve significant growth in the upcoming years. Raw materials used in battery manufacturing can pose threat to environment as irrelevant battery disposal can cause soil contamination as well as serious damage to surface and ground water. Hence, organization worldwide are emphasizing more on reusable battery materials as a step ahead towards green environment. In addition, many cities also offer battery recycling services. Some jurisdictions such as Canadian provinces and U.S. states provides a refundable deposit paid on batteries that subsequently encourages recycle of old batteries instead of disposal with household garbage. Escalating motor vehicle production in developing economies is other factor uplifting recycling battery material market. With increasing sustainability trends, electric vehicles have been striving a positive growth trend since past few years giving rise to an increasing demand for lithium ion batteries in the sector. Lead acid batteries were previously used as backup in electric vehicles but now are replaced with the former one attributed to lower charging efficiencies and legal controversies regarding these lead acid batteries. Despite of having wide end users and environment associated benefits, there exists some constraints in recycling process as well. Recycling cost associated with lithium ion batteries is very high coupled with environmental consequences and induction of toxic gasses in the process. Also, it becomes very difficult to recycle electrical vehicle batteries owing to their bigger size. On the basis of material, global battery material recycling market is segmented into iron, manganese, nickel, lithium, cobalt, lead, electrolytes, plastic and others. Among all the recycled materials, lead held the maximum share and generated revenue over USD 8 billion in 2018. This massive share is attributed to its ease of production without causing any quality reduction. They are mainly extracted from car batteries, UPS batteries, industrial fork-lift batteries, commercial batteries etc. APAC and Europe registered themselves as leading regions in lead recycling. Iron is the second most recycled material in 2018. It is majorly extracted from Nickel Cadmium batteries (NiCd), batteries which is then reused in steel production. Lithium held a comparatively small share in battery material recycling market size due to low weight composition (3% of the overall weight) of lithium in lithium ion batteries. Smaller share is also due to high associated cost and environmental issues linked with the recycling process. Although growing market of these batteries along with massive penetration of lithium based batteries is expected to boost recycling activities in this sector. For instance, lithium ion batteries have almost 100% penetration in mobile phones, laptops, cameras and other consumer gadgets. Recycled battery materials are reused in a number of areas including automotive, consumer goods and electronics, building and construction, aerospace and defense, packaging, textile industry and in many other areas. The products have their maximum application in consumer goods & electronics industry accounting a share of close to 30% in 2018 followed by automotive sector. As lead is the most recycled material in battery recycling process, it is reused in providing backup power in electronic equipment and automobiles to produce new batteries with high energy efficiency and reliability. Nickel cadmium batteries results in the extraction of maximum iron from recycling process and the recycled iron is then used in a wide range of foundries. Automotive sector makes the maximum use of recycled iron as 65% of vehicle constitutes iron and steel only. The recycled iron from batteries is also used in the production of stainless steel. Adding further, motor vehicle batteries are generally recycled after a long duration and the recycled material like plastic, iron, steel and lead are then used in manufacturing other equipment to be used in aerospace or in building and construction sector. Driven by several developing economies in the region, Asia pacific has registered itself as the strongest market accounting for over 50% of the overall battery material recycling market share in 2018. China contributes heavily in the market, as the country has been practicing a double-digit growth in battery production in recent years. India stood second in the market supported by its ramping battery production to meet the demand of elevating domestic motor vehicle production. Overall, Asia Pacific is forecast to post the maximum gains of around 9.3%, driven by its dominant advanced secondary battery production. 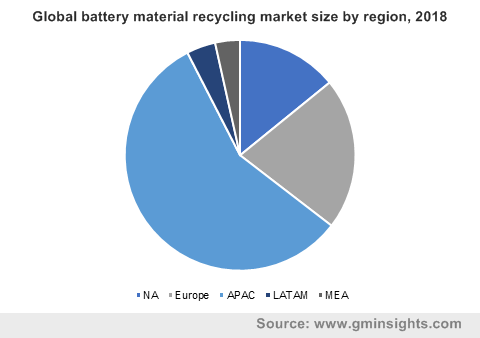 Increasing environmental concerns and strict government norms is making the way for Europe to led the global battery material recycling market. The battery directive regulates battery recycling market in the region with the aim to manage the increasing number of batteries in Europe. 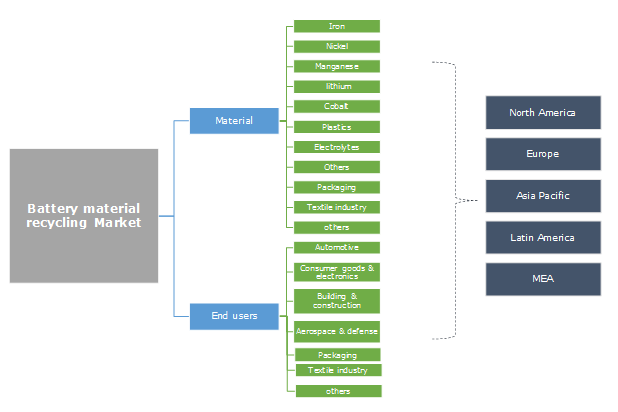 Technological developments in terms of energy density, price and environment impacts are some of the factors propelling material recycling material market. Battery materials recycling market constitutes several players due to increasing environmental concerns throughout the globe supported by a thriving demand in automotive sector. Some of the major players in the market are Johnson controls international plc, Battery solutions LLC, G&P Batteries, Eco-Bat Technologies Ltd., Umicore N.V, Exide Industries etc. The companies are adopting various techniques to move ahead in the market. Umicore is aiming to invest in scaling up its recycling capacity in the next decade to line up with growing electric vehicle (EV) market. Recycling battery material market is directly influenced by its end user segment. Batteries consists of toxic chemicals and heavy metals, therefore dumping them by the process similar to regular trash has raised concerns regarding water pollution and soil contamination. With growing automotive sector in Asia pacific region, the demand for batteries are also escalating which in turn is triggering the demand for recycling battery material. Innovation in technologies coupled with an increasing player in the market is also uplifting the market. Demand estimates in terms of volume and value depicts the overall material quantity recycled and revenue generated from the same.